4:01 "Star of the County Down"
11:04 "When She Held Me in Her Arms"
18:52 "Mickey's Jedi Drinking Song"
25:24 "Middle Earth Bragging Song"
28:31 "Soul of a Harper"
32:14 "Come and Be a Pirate"
38:36 "Men of New Basin Canal"
Welcome of the Pub Songs Podcast. This month, I'm gonna share a live concert I recorded during my Celtic Invasion of Brittany this past summer. But before we get there, let me share a little bit of news. First, I've been really good about my new show on Facebook. It's called Coffee with The Celtfather. It takes place around 9 am... some mornings. There isn't really a set time or date. I'm trying to do these shows at least once a week. So far, Monday has been pretty consistent. But we shall see. I also am trying YouTube as well. But the video quality doesn't strike me nearly as good as it is on Facebook. But I am cross-posting some Facebook videos to YouTube in case you are not on Facebook. If you want to keep these shows going, make sure you Share the Show or drop money in my Virtual Tip Jar. Sharing the show helps expand my audience on Facebook. And of course, tipping lets me know that you really appreciate me making time to bring you good music online as well. I have a bunch of new CD specials this month. Most are on my Bandcamp page. You can buy one Christmas CD for $20 and get three more. Best of all, these CDs can also be used as greeting cards. I only have a limited number of these album/greeting cards left. So get yours soon. I sold my first Celtic Heartstring this week. The Celtic Heartstrings are made from the broken strings of my heart... I mean autoharp. I turn them in Celtic knot jewelry. Each one is unique. So I will try and post a new one every week or so. I want to send a Huge thanks to my New Patrons in the Gunn Runners Club: Jan DiMasi, Kimber Grey. Thanks to new Gold Runners Anita Gorrell and LauraMay Sorkin who raised her monthly pledge this month. Alright. Next summer, I'm leading my next Celtic Invasion Vacation to the Isle of Skye in Scotland. These vacations are pretty incredible. We stay in one location and drive out to see the countryside. I make dinner some nights. I also play music. Last summer, I recorded one of my concerts in our vacation rental. I'm gonna share that with you this month on the Pub Songs Podcast, in its entirety, complete with all my mistakes. Let me set the mood. I think it was Wednesday evening. We had just finished up long day of sightseeing on the Celtic Invasion of Brittany, I believe to the Cairn of Gavrinis. That included a boat trip. You can watch a video about it on YouTube and hear my recording of "Between the Devil and the Deep Blue Sea". We were tired, but as we finished eating, I felt it was time to share some music. So I sat down and started playing. Invaders slowly filed into the living room to listen. 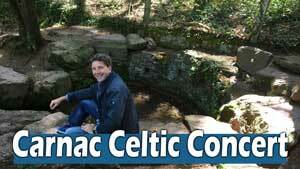 Here's my Carnac Celtic Concert. If you want to find out more about the Celtic Invasion of Scotland, the basic itinerary is now online. We're gonna fly into Inverness. We'll then drive to the Isle of Skye and explore the island, it's history, and hopefully some good legends as well. Find all of the details here.